The flour and oatmeal mixture serves as the crust as well as the crumbly, streusel that tops the dried cherry filling in this recipe. Dried cranberries or finely chopped dried apricots can be substituted for the cherries. 1. Preheat oven to 325°F. Coat an 9-inch square baking pan with nonstick cooking spray, and set aside. 2. Make the crust: In a large bowl, combine the oats, flour, brown sugar, salt and baking soda and mix with a fork until no lumps of brown sugar remain. Cut in the butter with a pastry blender, two knives, or you fingers until the mixture is crumbly. 3. Set aside 1/2 cup of the oatmeal mixture for the topping. Press the remanding mixture evenly in the bottom of the prepared baking pan. 4. Make the filling: In a medium bowl, combine the dried cherries, sour cream, sugar, flour, egg, lemon zest and vanilla and mix well. Spread the mixture evenly over the crust. Sprinkle the top with the reserved oat mixture. 5. Bake the bars until the top is golden, 30 to 40 minutes. Let cool in the baking pan on a rack. 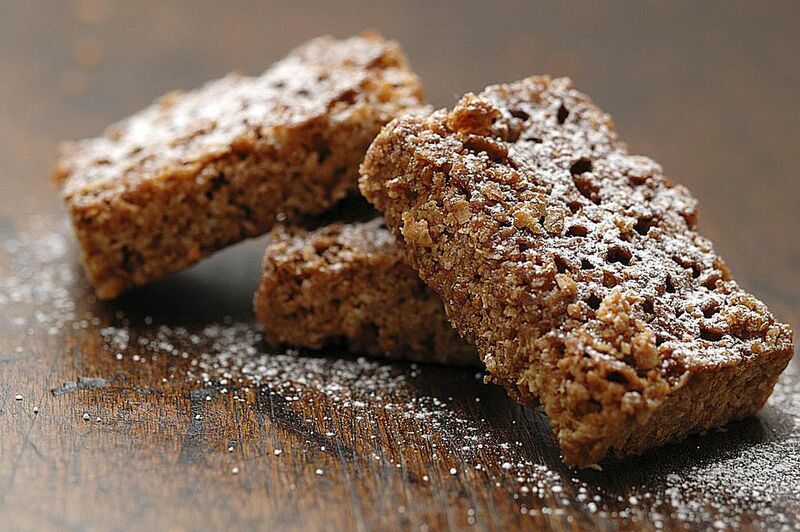 Cut into 15 bars.The flour and oats mixture serves as a solid base for the soft butterscotch chip layer and a crumbly, streusel-like topping.The flour and oats mixture serves as a solid base for the soft butterscotch chip layer and a crumbly, streusel-like topping.